ELI is a Gothic Metal act fronted by Italian singer Eliza Pezzuto. The debut album "Darkness Will Fall" is to be released by Lion Music on December 5th 2008. “Darkness Will Fall” sees gothic metal fused with symphonic and progressive elements blended to make an accessible album created to showcase the vocal abilities of Eli. The album has some traits that can be compared to Evanescence or Within Temptation yet the album has its own flavour and unique personality with its strong classical and symphonic edge. 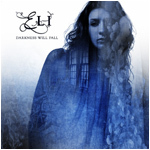 The music shows an expansion of the musical styling’s Lars Eric Mattsson has turned to in recent years, yet “Darkness Will Fall” should be considered more of a framework for the vocals of Eli. Lyrically the album touches on personal relationships, how mankind is treating planet and more. The album was written between January 2008 and July 2008 and the recordings took place in Finland (music) and Italy (vocals). All the music was composed and produced by Lars Eric Mattsson. The actual recordings for “Darkness Will Fall” took place between March and September 2008 and was mixed in October at the new Lion’s Cage studio, Finland. • Turn This World Around. • Welcome to My Dream World. • Back to Your Grace.